Art book for upcoming Wii U game appeared to feature a gender-swapped Link. "The art book explicitly states that the character was "devised as being sister-like" (note that the text actually says, 妹的 or "imouto teki," which means "little sister-like." On English language sites, some people are are confusing "little sister" (妹 or imouto) with "daughter" (娘 or musume) and incorrectly believing that this is Link's daughter. It's not." Unfortunately for those who were excited at the prospect of playing as a female Link in Hyrule Warriors, Ashcraft also notes that Linkuru appears to be part of a section of the book devoted to rejected/unused original characters. Original Story: Earlier this year, the reveal of the yet-untitled Wii U Zelda game featuring an atypical-looking Link touched off controversy and discussion about the possibility of the next Link being a woman. Now, a Japanese art book for the upcoming Zelda/Dynasty Warriors crossover Hyrule Warriors may have revealed that it's no longer simply a possibility. 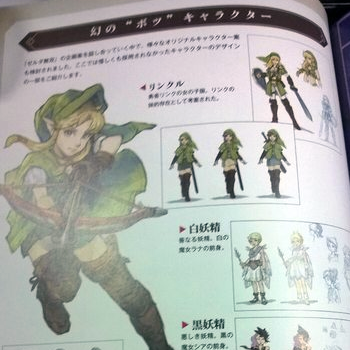 Photographs (not direct scans) of the book's pages (the accompanying text to which are all in Japanese) have appeared online, and they appear to show concept art of a character who looks very much like the traditional Link but with unmistakably female features in her(?) face and outfit. The largest image of the character is depicted wielding a crossbow, but smaller views show her using a sword and shield as well. The text is not 100% visible, and no official English translation has yet appeared. As it is apparently concept art, it is not yet known whether this character will appear in the actual Hyrule Warriors game or if the pages depict a rejected idea. While this could be a new character exclusive to the game or a reveal that players will be able to choose the gender of "their" Link; as Warriors incorporates characters from multiple series throughout the Legend of Zelda timeline it is at least hypothetically possible that this character is the heroine of either the Wii U title (or some other yet-to-be released game) making an early appearance. There has been no statement from Nintendo at this time.